This topic contains 2 replies, has 3 voices, and was last updated by Anonymous 5 years, 9 months ago. The Palace of Princess Carlota is located at No.32 on Calle Luna in Madrid, it is a beautiful neoclassical XVIII century building designed by Juan de Villanueva who was the designated architect of Spain’s House of Bourbon. The building has housed not only Princess Carlota but also Don Francisco de Paula, brother of Kind Fernando VII. However, its illustrious past is in little evidence now as its owner has split the building into flats which are let to mainly Asian, Eastern European and Brazilian immigrants. Inside, the Pompeian frescoes are covered in limescale, the internal structure destroyed by renovation, and where decorative ornaments used to lye in the building’s alcoves there is now just empty space. Signs can be seen covering the walls asking tenants not to spit or litter with cigarette butts and warning against damaging the front door which has been vandalised 3 times in recent months. The company Cintia Real S.L. is blamed by the local council for the deterioration of the historic palace due to illegal renovation work. The company’s owner is an Iranian investor, Ali Taefi, who bought the palace in 2001 for 3.1 million euros through another company, Simo Euro Interprais S.L..
Taefi has been linked with the notorious Gil clan of Marbella and has been investigated in connection with illegal payments of 589,000 euros to the PSOE political party in Andalucia for the development of the Las Cascadas golf course near Marbella. 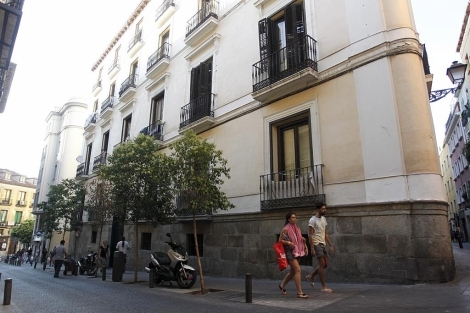 After an attempt to build housing in the palace’s interior in 2004 the Madrid regional council suspended the work due to lack of planning permission. In 2005 the building was declared bankrupt and its tenants were evicted. The then Minister of Justice, Alberto Ruiz Gallardón, stated that the building would be “expropriated, renovated and would be used to create social or cultural facilities” as it was protected “to the highest level”. Despite all of this the building has been allowed to remain in Taefi’s ownership and turned into an apartment block. That street has a certain reputation…. Typical to blame all & sundry. Why did the Council or a body that looks after heritage buildings not act in time ? how much back handers did they pocketed.